In this article, you'll learn how to use ElastiCache as caching layer in front of DynamoDB, boosting performance and saving costs. DynamoDB is offering a managed, scalable, and highly available database. Compared to SQL databases, a big advantage of DynamoDB is the ability to scale the read and write throughput. This allows you to scale the database along with your application layer, no matter if you are using EC2 behind ELB or API Gateway with Lambda. You'll learn how to use ElastiCache as caching layer in front of DynamoDB boosting performance and saving costs during this article. A typical project creating a cloud-native application starts with huge enthusiasm during the development process. DynamoDB allows the app to run fast and reliably with almost no operational efforts. But when real traffic hits, the app throttles and rejected DynamoDB requests bring beads of sweat to on-call engineers. 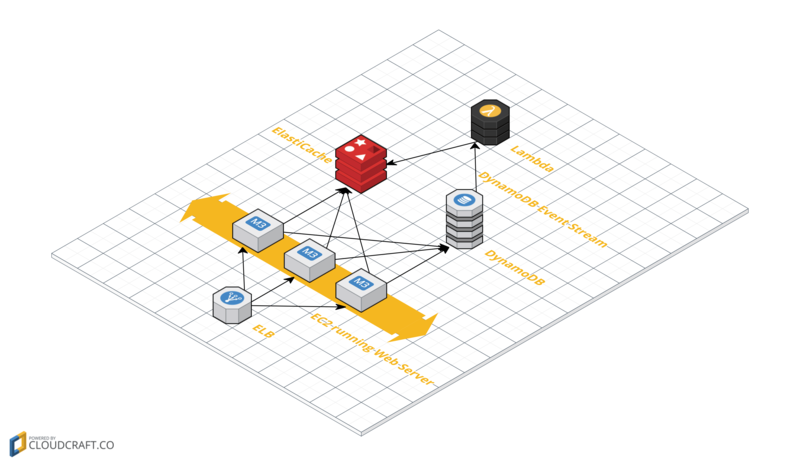 Increasing provisioned throughput capacity of DynamoDB is solving the issue. Everything seems to be fine until the first AWS bill including the charges for the newly provisioned throughput arrives. Another bitter pill: Each call to DynamoDB is expensive from a performance perspective. Product and QA managers are starting to ask for performance improvements to increase customer satisfaction. Charges for the amount of data stored. Charges for the provisioned read and write throughput capacity. Here's a very simple formula to save costs: Fewer DynamoDB requests = Less provisioned throughput capacity = Cost savings. The idea of avoiding requests to databases is not that new. Using caching systems to store popular requests to a database has been a popular pattern long before DynamoDB and Auto Scaling existed. Modern caching systems are storing data in-memory. That's why a request to the caching system will add latency than requesting data from DynamoDB, where it is stored on SSDs. 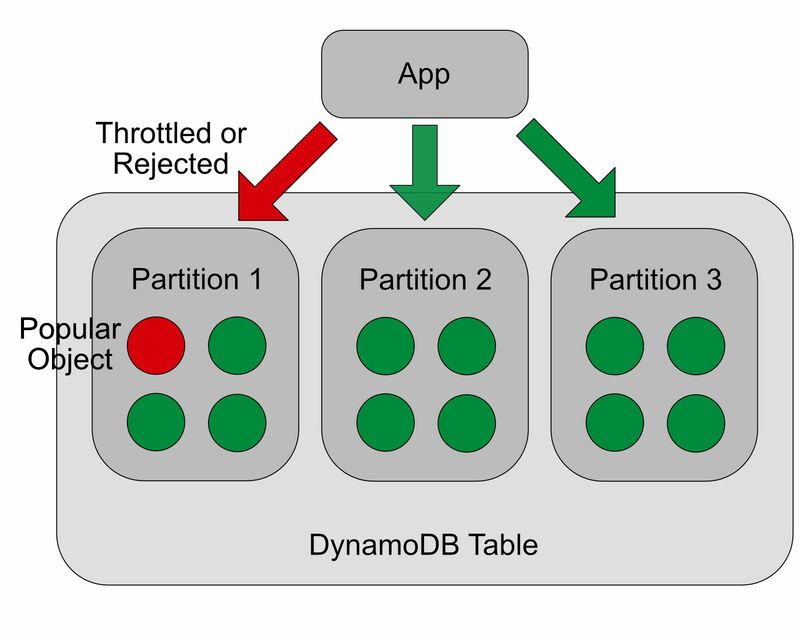 DynamoDB adds partitions to your tables as needed in the background. Important to know: the total provisioned throughput is divided evenly among all partitions. Assuming you have provisioned a read throughput capacity of 9,000 units, your DynamoDB table consists of three partitions. You are able to use 3,000 units to read data from each partition. Not a problem — if your read requests are hitting different objects on all three partitions. But what if the majority of requests are hitting the same object as illustrated in the following figure? In this case, the maximum read throughput will be 3,000 read units instead of the provisioned 9,000 read units. Sometimes it's possible to design the data structure of your application in a way that it becomes very unlikely that the majority of requests will hit the same partition. But there are scenarios where it is impossible to distribute read requests among many different partition keys. Storing a product catalog on DynamoDB. A popular product is requested by 90% of all customers. Storing blog posts on DynamoDB. The newest blog post is trending on Hacker News and is generating a huge amount of read requests. Using DynamoDB in these scenarios is probably uneconomic as you would need to provision huge read throughput capacity without really using it. Sound frustrating? There is a simple solution avoiding DynamoDB requests in general and distributing DynamoDB requests among partitions: placing a caching system in front of DynamoDB to catch requests hitting the same object and partition over and over again. AWS is offering in-memory stores, allowing you to cache read requests to DynamoDB and other database systems: ElastiCache. ElastiCache is a managed service providing two different engines: memcached and Redis. The service is comparable to RDS: No need to maintain EC2 instances, just choose the size of cache nodes and cache clusters and pay a small fee on top of plain EC2. ELB acting as a load balancer forwarding requests to EC2 instances. EC2 instances running the application requesting data from ElastiCache and DynamoDB. DynamoDB storing the data used by the application. ElastiCache caching read requests to DynamoDB. Lambda to invalidate and update the cache whenever an object stored in DynamoDB is created, updated or deleted. Sure, naming things is hard. But setting up cache invalidation is not that hard when using the following building blocks: ElastiCache, DynamoDB, DynamoDB Streams, and Lambda. Stay tuned for my next blog post covering this exact topic!